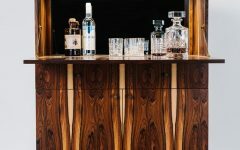 They are beautiful in their simplicity, capable of pulling a modern interior together in a practical, yet expressive way. But when it comes to picking the right curtains or window treatments for your space there are some rules to follow. The margin for error when hanging curtains is surprisingly large and is capable of turning your home improvement project into an epic Pinterest fail. So, what window treatments should you use for your space and how do you hang your curtains right? 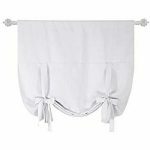 * Perfect curtain for kitchen or bathrooms. * Works well with most window lengths. * Nice fabric weight and quality. * Option to hang these curtains three different styles. * Nice pleat detail makes them look very chic. * Heavy, good fabric and quality for the price. * Can easily order swatches to find the right color. * Come in multiple lengths for high ceilings. * Black out and keeps heat in. * Need a steamer to steam the curtains after hanging them up. Aside from buying the wrong size curtains, improper rod hanging is one of the most common mistakes people make when hanging drapes. It’s easy for most people to hang a pair of curtains or drapes by attaching the bracket to the outside edge of the molding that frames the window. They attach the rod, hang the curtains and call it a day. However, the problem with hanging window treatments that way is when you go to open them, only the center of the glass or window is exposed. The drapery fabric has no place to go. Instead, stack back is achieved when you mount your drapery rod on the wall, not on the molding that surrounds your window. This will quite literally give the room air to breathe, allowing the fabric panels to stack back on the wall. Measure the width from the outside left to the outside right of your window frame. It doesn’t matter if the window is a bow, picture, multiple casement or double hung; this measurement should work well. Take that measurement and calculate what 25 to 30 percent of it is. Take that number of inches and divide it in half. The result is the distance from the outer edge of the molding, around your window frame, to mount your drapery hardware. For example, a 100-inch long picture window, divided by 4 (for 25 percent) = 25 inches. Twenty five inches, divided by two = 12.5 inches, which is how far out on each side to extend your rod. If you have a corner window, sliding glass or patio door, it might be best to Stack Back all of your drapery fabric on one side. There are right pull and left pull traverse rods, and vertical blinds can be pulled back from the left or right. Stack Back is akin to the first step in the process of hanging window treatments. It’s a common error for many people to mount the rod at the exact top of the molding surrounding the window. The drapes hang down from that point. Instead, curtains should be mounted above the window. Why? How you hang curtains creates an illusion of height in a room. When the eye looks at the draped window, it thinks the top line of the drapes is the height of the ceiling. By mounting the rod above the window, or as close as possible to the ceiling, you make the room feel taller than it actually is. This is particularly important in homes with higher ceilings, a feature many homeowners pay a premium to possess. Protect that investment by hanging curtains accordingly. In addition, don’t forget to look for blackout curtains to keep the light/glare away during sunny days. Valances are a fun, relatively inexpensive way to add some decorative flair to window treatments. 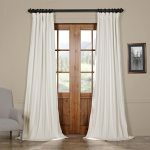 They are much shorter than the curtains themselves, and are used as a heading to conceal the top of the drapes and hardware. They are beautiful additions to any window treatment, but they are commonly hung at the incorrect height. When a valance is hung from the top of a window frame, it is capable of blocking your view outside. Instead, hang it high! 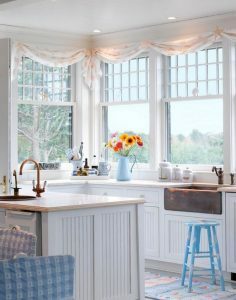 Position a valance above the window, so just the bottom edge of the valance completely covers the top piece of the window molding and sash that holds the top off your window pane. Hint #4: More fabric is better! Whoever said drapes should look like ball gowns hung on a window knew some things about interior design. 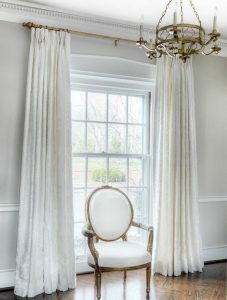 Calculating how much drapery or curtain width is needed to properly cover a window is about as important a step as any. Because drapes should indeed be full and voluminous of fabric, never skimpy things stretched across a window. The first thing to consider is how far out from the wall the rod extends, known in design as return. This measurement could range between three to six inches, or more, with a combination traverse and valance rod. Whatever that number is, multiply it by two. This number gives you your right and left return. If you are using a traverse rod, which opens and closes by pulling a cord, there is a center overlap of four inches. You want one drapery panel to pass in front of the other in the center when they meet. For example, if your rod extends out four inches from the wall on each side, that measurement is four times two = eight. If the center overlap is four inches, between the right and left return, and the center overlap, you have 12 inches. Now add the 12 inches to the length of your rod, hung on the wall for Stack Back. That is the minimum amount of drapery with you need to properly dress your windows. For double height windows you can have electric shutters at the top or on all windows or have window treatments to cover the entire window. Double height. Beautiful velvet curtains would add the blackout functionality and chic look. The three-quarter window treatment is not long enough to be a drape and not short enough to be a curtain. Instead, go long or short with your window treatments. Go big or go home. Unless your home has three-quarter length curtains. Because in that case, it may be time to head to the store. Shutters and curtains have developed a love-hate relationship over the years. The main reason for discord? User error. 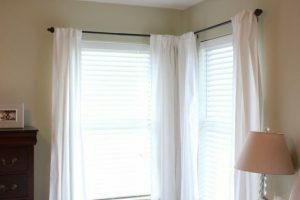 When high-quality shutters and shades are purchased from a reputable company and installed properly either by a homeowner or a professional, the pairing with curtains and drapes is stunning. 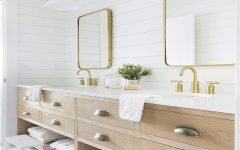 Yet many homeowners don’t consider all the options and often fail from the start by making assumptions. 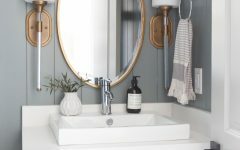 Home improvement stores are a good starting point, but specialty stores might be a better choice. Those shutters your neighbor across the street installed are not necessarily the right fit for your home. 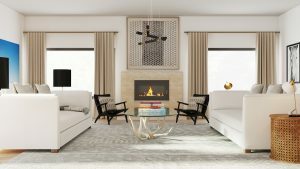 Take time to do your research and find what will best and most effectively compliment your unique window treatment needs before diving into the shutter selection process. Make sure you start with the correct hardware, take accurate measurements, mark the bracket locations and install the shades accordingly. Always install mounting brackets first before the blinds or shades. For roller shades, allow 1/4″ clearance between the top of the frame and the fully rolled-up shade. Also be sure to closely follow safety clip installation instructions. For electric shades, use your tape measure to measure the distance between the holes on the back of your window shades before starting installation. It is common for the shades to be a certain size completely different from the actual distance between the mounting holes. If you want something done right, sometimes it makes the most sense to hire some help. Custom-made drapes and window treatments take the guess work out of everything for you. The professional will come and take measurements and you will get exactly the right amount of drapery for what you need. If hiring someone is outside your price range, ask friends and family for help. Or take up a new craft, like learning to sew! You can put together multiples of different sizes of pre-made drapery panels, because no two windows are the same. Don’t get backed into a corner. Embrace it. Corner windows get a bad rap, but it’s nothing a makeover can’t fix. If there’s a place for curtains and drapes to take center stage, it’s in corner windows. 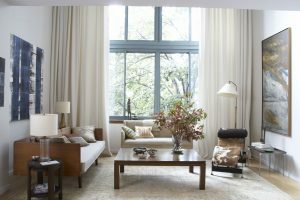 For many homeowners, the concept is better set aside because corner window curtain installation can be challenging. There’s good news: it doesn’t have to be. Whether you’re using wall mounts or curtain wire, start by measuring and marking the preferred position of the mounting hardware. For wall mounts, the wall hook should be just outside the window frame’s outer edge at either end as well as the corner. Use a level to ensure the three spots are the same height and a stud finder to help support bracket assembly. For curtain wire, add 12 inches to the distance from the screw mount on the outer side edge to the corner and around to the other side. This is the length of curtain wire you will need. Ceiling-mounted rods and a curtain rod connector are suggested for use with floor-to-ceiling windows. Using the ceiling to hang curtains can be great for many different spaces. For example, bathrooms. 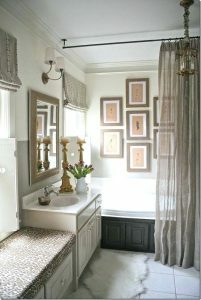 These days bathrooms can be tiled wall to wall which makes it hard to add the curtain hanging on the wall. Use the ceiling. Curtains and drapes are ultimately an expression of your personal style and lend a sense of personality to your home. Sure, they also are practical pieces that can help you cut down on electric costs in the warm summers and cold winters. But installing drapes and curtains should be fun. 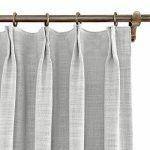 There are a lot of ways to get creative while still keeping in mind the most common pitfalls of hanging curtains and drapes. One example best suited for a more formal home environment is puddling. Installing puddling drapes is a beautiful way to add elegance and grace. To achieve this more formal look, buy drapes 12 inches longer than necessary. Arrange the extra fabric on the floor in a billowing, cloud-like way. This look would work best as a simply decorative option. In these cases, consider adding blinds or shades for functionality. Because in the end curtains and drapes are beautiful in their simplicity. They are capable of pulling a room together. While the margin for error when hanging curtains is surprisingly large, the most important thing isn’t just making sure you hang your curtains right. It’s that you have some fun in the process.